T.S. Eliot was clearly onto something when he asked, “If you aren’t in over your head, how do you know how tall you are?” The very act of stepping outside of your comfort zone is critical to your success and well-being. Our brains are wired such that it’s difficult to take action until we feel at least some stress and discomfort. In fact, performance peaks when we’re well out of our comfort zone. 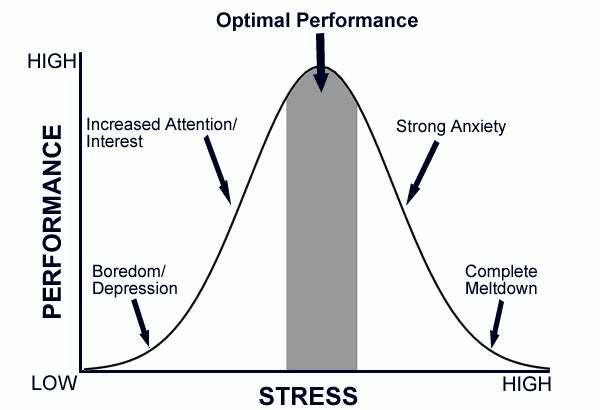 If you’re too comfortable your performance suffers from inaction, and if you move too far outside of your comfort zone you melt down from stress. Peak performance and discomfort go hand in hand. Stepping outside of your comfort zone makes you better, and it doesn’t have to be something as extreme as climbing Mount Everest. It’s the everyday challenges that push your boundaries the most, none of which require a flight to Nepal. Step out of your comfort zone and embrace these challenges. Unless you’re a morning person, getting up earlier than usual can take you way out of your comfort zone. However, if you get up well before you have to start getting ready for work, it’s worth it. It gives you an opportunity to collect your thoughts and mentally prepare yourself for the day ahead, rather than just dashing from one activity to another. It also gives you the opportunity to eat a good breakfast and exercise, both of which have well-known health benefits. Few things compare to the exhilaration of accomplishing something that you didn’t think you were capable of. These achievements fall so far outside of your comfort zone that they seem impossible. Maybe it’s running a marathon or giving a keynote speech at a convention. These accomplishments are worth every bit of suffering you endure to achieve them because once you finally do it, you feel invincible and carry that triumph with you forever. It’s easy to get stuck in your comfort zone when you’re so busy that you don’t slow down enough to really think about what you’re doing and why you’re doing it. Meditation is a great way to break this cycle and also happens to be very good for your brain. Harvard neuroscientist Sara Lazar found that meditation creates important physical changes in your brain. It increases brain density in areas responsible for self-control, focus, problem-solving, flexibility and resilience. Best of all, these changes are lasting. Focusing completely on a single task is a big risk -- the risk of failing at something to which you’ve given your all. That’s why it’s so uncomfortable. The alternative -- multitasking -- is a real productivity killer. Research conducted at Stanford confirms that multitasking is less productive than doing a single thing at a time. The researchers found that people who are regularly bombarded with several streams of electronic information cannot pay attention, recall information or switch from one job to another as well as those who complete one task at a time. When you try to do two things at once, your brain lacks the capacity to perform both tasks successfully. When you spread yourself too thin and chase after every bright, shiny thing that catches your eye, you’re missing out on an important opportunity for personal growth. It would be great if everyone volunteered for purely altruistic reasons, but we all have demands on our time and have to set priorities. The problem is that after a long workday, volunteering can get pushed down somewhere below watching “epic fail” videos on YouTube. Volunteering is a powerful experience that feels good and expands your network at the same time. Have you ever met anyone who made volunteering a priority and wasn’t changed for the better by the experience? Neither have I.
You’ve likely heard that the majority of people fear public speaking more than death. In fact, 74 percent of Americans have glossophobia (the fancy word for a fear of public speaking). So, yes, it’s a challenge. It’s also worth it. Whether you’re addressing five people around a table or an audience of five thousand, becoming a better public speaker can be a huge boon to your career. Unless you’re an extreme extrovert -- or a politician -- talking to new people probably makes you at least somewhat uncomfortable. Do it anyway. Social interaction is good for your mood (even when you don’t like it), expands your network, exposes you to new ideas and boosts your self-confidence. Sure, it can feel so good to unload on somebody and let them know what you really think, but that good feeling is temporary. What happens the next day, the next week or the next year? It’s human nature to want to prove that you’re right, but it’s rarely effective. In conflict, unchecked emotion makes you dig your heels in and fight the kind of battle that can leave you and the relationship severely damaged. When you read and respond to your emotions, you’re able to choose your battles wisely and only stand your ground when the time is right. The vast majority of the time, that means biting your tongue. Research conducted at the University of California, San Francisco, showed that the more difficulty that you have saying no, the more likely you are to experience stress, burnout and even depression. Saying no is indeed a major challenge for many people. No is a powerful word that you should not be afraid to wield. When it’s time to say no, avoid phrases such as I don’t think I can or I’m not certain. Saying no to a new commitment honors your existing commitments and gives you the opportunity to successfully fulfill them. When you learn to say no, you free yourself from unnecessary constraints and free up your time and energy for the important things in life. Change is hard. Self-improvement is hard. Scrounging up the guts to go for what you want is hard, and so is the work to make it happen. When things are hard, it’s always easier to decide to tackle them tomorrow. The problem is that tomorrow never comes. Saying you’ll do it tomorrow is just an excuse, and it means that either you don’t really want to do it or that you want the results without the hard work that comes along with it. Staying in your comfort zone means stagnation. Just as an oyster only makes a pearl when it’s irritated by a grain of sand, no one has ever accomplished anything remarkable when comfortable. A version of this article appeared on TalentSmart.